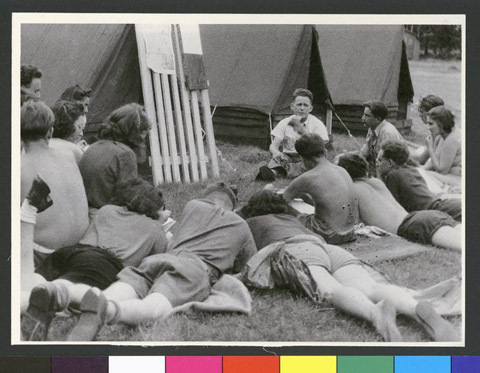 JDC - Archives : A group of young men and women relax on the grass outside a tent as one adult lectures. Title A group of young men and women relax on the grass outside a tent as one adult lectures. Description A group of young men and women relaxing on the grass outside a tent as one adult lectures. Programs for recreational camps were organized for refugee children in the Foehrenwald DP Camps, located southwest of Munich near Wolfratshausen. The camp was the last one to close in 1957.